Woody Boater Hits Over 100,000 Hits, WooHoo! 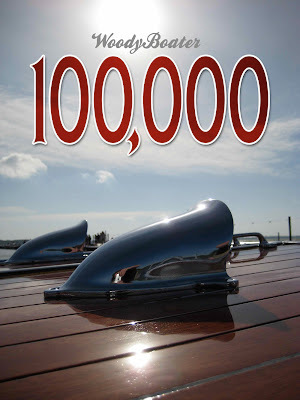 Thanks to you loyal readers WoodyBoater has broken the 100,000 viewer mark, actually over 125,000. With an average readership of 7,500 a month and 15,000 views a month with an average monthly growth of 20% we are officially on a roll. The busiest day was during the Lake Dora Show with over 800 views a day. The other spikes in readership are when I yell at the ACBS. Which kills me a little inside every time I do it. It’s not in my nature to poke great folks in the eye… but if we don’t no one will. California leads the way with 7,000 viewers and then NY.. FLA, Illinois and Michigan are right up there. I don’t count Virginia, because it’s our home state. but wow 5500 viewers, me not included makes Virginia a classic boat state? Boats and Babes are way out in front as the top readership clicks. Folks spend close to 6 minutes on the site when they visit. For a small blog these numbers are mind blowing, considering that the hobby at best has 15,000 folks in it. We are humbled and extremely grateful for readership. In the upcoming months we are ramping up a new woodyboater, more everything. This is a true joy to do and even more fun when the comments come in. Thanks..
Congrat’s, WoodyBoater. Fantastic! It’s good to be amoung good company here and to be included in those number stats. Thanks for your time, energy and sinse of humor. Matt, congrats on the 100k. I’m proud to represent the state of Colorado, but I wish I was in Virginia w/ you folks. Someday soon. Great Work Matt, I never miss a morning checking in with you. The fact that I read that diminished rag the Richmond Times Dispatch FIRST, is just habit….and about to change. I hope to go to the tidewater woodies show at Colonial beach this weekend, but a bit up in the air on that schedule wise. You are doing a great job. I read your site every day. It is such a pleasure to see someone take a time to keep everyone informed about what is going on in such a special hobby. Congradulations. I know I am doing my part with at least one login a day. I always look foward to seeing what is next. Kudos for your responsiveness to readers needs as at the Mount Dora show. It is nice to see the variety of boats around and all the stuff that goes with them. Keep up the good work and I will keep reading and throwing the stray comment your way. And you thought nobody was looking! Just because some of us are quiet types and don’t comment very often. You are part of my morning routine, can’t live without you! Don’t stop, definately part of the daily routine. Get miffed when you miss a day or post late then I remember, oh yea its FREE! Great Job. i got back from myrtle beach over the weekend and i was checking in on woodyboater within 10 min! lol….i’m hooked! One more from shout out from Texas! Always good and never afraid too tell it like it is! Sure your not a Texan? Congratulationsp the and keep up the good work. Great Job Matt keep up the great work. What boat belongs to the engine hatch you have pictured? ahhhhhh! I think it was a GarWood. I took hundreds of shots and I recall that boat being with a mess of GarWoods. I loved those vents. They have just the slightest flair about them. Long time lurker. Seldom poster. Thanks for all the work you put into this. My morning coffee wouldn’t be the same without it. Thanks for sharing your Woody Boater passion. Illinois #4? I’ll have to check back for comments more often throughout the day.